Welcome to the first post on the new Strata blog. This is the place where we’ll be sharing the latest news about Strata, as well as tips and tricks, case studies, highlights of interesting extensions and various examples. To kick things off, we’re happy to let everyone know that we’ve just created a new Extensions section. The Strata Extensions section contains an Extension Library, where we’ll be adding our own creations as well as applications developed by the community. It also contains some help for developers, including an Extension Wizard, which creates extension packaging and sample scripts, and a Developer Resources section, which provides useful information about developing scripts/extensions in Strata. As a sample application, “Hello, World Wide Web” provides a basic example of some of the hybrid web/desktop options available with Strata’s interface controls and highlights how you can embed a browser control in a form with just a few lines of code. 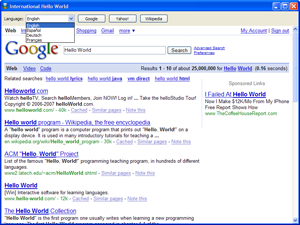 Download the Hello World Wide Web extension from the Extension Library. Convert it to a ZIP file by changing the file name from “hello_world_wide_web.kxt” to “hello_world_wide_web.zip”. Extract the contents of the ZIP file to a new folder. In Strata, select Create Connection from the File menu and click the Browse button to find and select this folder and it will appear as a connected folder in the Project Panel. Expand the folder in the Project Panel and double-click the “hello_world_wide_web_form.js” file. If you would like to explore the code for this extension a bit more, you can get variations of this extension as well as other individual script components from the Extension Wizard. This wizard gives you a quick way to grab smaller chunks of code to play around with or generate simple templates for different functions that you can modify or build upon. We hope you have fun playing around with “Hello, World Wide Web”. If you would like to improve on it and share the results with us, please do so. We’d love to hear from you. You can submit new extensions or any improvements via our extension submission form. As for future versions of “Hello, World Wide Web”, we certainly would welcome having more language options. Heck, we’d even take languages that don’t exist in Wikipedia today — how does one say “Hello, World” in Klingon?